For L.L. Bean, the road from glossy cataloger to national chain has been a rocky one. When the Maine merchant of everything outdoors began opening stores beyond its Freeport flagship six years ago, merchandise arrived without price tags or size stickers, the shops ran out of stock, and customers couldn't find products they saw in catalogs. So L.L. Bean retreated and spent the next five years honing its retailing skills, getting tips from a successful catalog-to-bricks-and-mortar merchant, Williams-Sonoma Inc., and hiring executives with experience in running stores. With the opening of its store today in Burlington, L.L. Bean embarks on an aggressive campaign to spread its brand across the country with 26 retail shops -- a fivefold increase -- over the next several years. The company is also eyeing international markets, including Canada and Costa Rica. ``This is huge," said Ken Kacere , senior vice president of L.L. Bean's retail stores. ``The future depends on what happens in Burlington." What's different this time around? L.L. 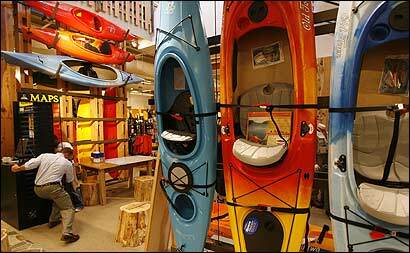 Bean stores will offer just about everything from fleece gloves to camping tents to mirror their catalogs. The stores will open in shopping centers with accessible parking so customers don't have to lug kayaks through a mall -- a mistake the retailer made during its last expansion. Burlington and other locations will have a full bike store and mechanic, as well as ``outdoor discovery schools," where people can try products both on- and off-site, such as fly fishing at Horn Pond in Woburn. By doing so, L.L. Bean hopes to lure customers by selling the experience of shopping as much as the products -- just as it has at its successful flagship store, which attracts about 3 million people a year. ``We thought, based on our experience in Freeport, we knew retail back in 2000," L.L. Bean's chief executive, Chris McCormick, said. ``We didn't know retail. We weren't ready. Now we are." There is some risk that the new stores will cannibalize sales from L.L. Bean's catalog business, or from its flagship store in Freeport. The expansion also comes at time when traditional retailers are consolidating, such as with Macy's recent takeover of Filene's. L.L. Bean also faces a growing number of outdoor rivals, including Bass Pro Shops, Cabela's, Eastern Mountain Sports, and REI. ``It's an eat-or-be-eaten market," said McCormick, L.L Bean's first chief executive who's not part of the Bean family. ``The way to survive is to steal customers -- which means opening more stores." L.L. Bean, founded in 1912 by avid outdoorsman Leon Leonwood Bean as a mail-order business, has grown into a global company, with a reputation for quality products and annual sales of $1.47 billion in 2005. About 80 percent of its revenue comes from Internet and catalog sales; the rest, from retail stores and 14 discount outlets. McCormick said he wants to make the retail stores a billion-dollar business within 10 years. Last year, L.L. Bean spent tens of millions of dollars to offer free shipping during the holiday season, but made just enough in sales to offset the cost. Still, at 4 percent, the increase was only half the growth during 2004. McCormick said the company needs new stores to fuel growth. Shoppers still buy most of their apparel from stores -- less than 7 percent comes from Internet and catalog orders, according to the retail consultancy Kurt Salmon Associates. That means L.L. Bean is missing out on major sales opportunities. Rival Cabela's realized the same thing when it began aggressively opening stores several years ago, after spending its 45-year history selling outdoor goods mainly through catalogs, said spokesman Joe Arterburn. Now, the Nebraska company has several stores planned in New Jersey and Connecticut and is scouting for sites in L.L. Bean's stronghold, Maine. But after opening stores in three locations in two years, L.L. Bean in 2002 called off plans for further expansion, because sales fell below expectations and executives realized they were in trouble. ``Even though you're selling the same or similar merchandise to the same targeted customer, the catalog business is very different from running a store," said Pat Connolly, chief marketing officer at Williams-Sonoma, which also runs the Pottery Barn chain. ``It took us 20 years to perfect what we're doing today, and we're still learning." Tips gleaned from the San Francisco home goods merchant and other retail experts included the need to create inventory and distribution systems that are separate from the catalog operation, the importance of locations with quick access to parking, and a fresh product assortment that reflects merchandise in catalogs. L.L. Bean also wants to make it easy for customers to return goods purchased from catalogs in stores, and to return store items to the catalog operation. Walter Loeb , of the New York consulting firm Loeb Associates Inc., said a major challenge for catalogers is developing the ability to be innovative when they open stores. One of L.L. Bean's catalog competitors, Lands' End, has tried to make its way into retail stores through a partnership with Sears Roebuck and Co., where its clothing is now carried. But Loeb said that deal hasn't succeeded, because the store displays are boring. ``L.L. Bean needs to give customers a reason to shop there frequently -- the merchandise and experience has to drive the traffic," Loeb said. L.L. Bean hopes the stores will expand awareness among its loyal baby boomer following -- the average customer is about 50 years old. But L.L. Bean is also looking to launch a new brand or acquire a company that targets younger customers. There's also interest in starting a travel-services division. But for now, all eyes are on Burlington, where the company has piled kayaks two stories high and installed fish tanks in the middle of the store. ``What we're trying to do is take something that is special and make it come to life in a place that isn't 95 years old," said L.L. Bean executive Kacere. ``This is more than just a store."